Now in its fourth season, the Le Mans Series seems to have overcome the always difficult take off period. Both the over-subscribed entry list and the arrival of Peugeot as a full Works effort are the best examples of the good shape the Series is in. After the official test session at Paul Ricard, the season kicked off for real less than three weeks later at Monza. It all started at the Italian track back in 2004 with a handful of prototypes and a fleet of Porsches, and now there are almost as many prototypes as there are GTs. Later in the season, the prototype numbers should rise even further when more of the new cars will debute. The large field and the familiar action will make sure the 1000 km or six hours races are never boring. All of the weekend's action has been captured in the following report and the exclusive 190-shot slideshow. One of the most exciting periods every season is the time building up to the first race, usually spent speculating on who will have the best chances at winning. With the arrival of so many new cars, in no small part courtesy of the rule changes, there were plenty of speculations this winter. The Paul Ricard test did not help much and it almost raised more questions than answers. 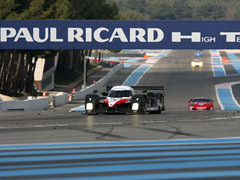 All eyes were of course on Peugeot, who for the first time pitched their new 908 HDis against the seasoned competitors. It did clock the fastest time, but failed to impress. More impressive was the roll-out of the brand new Pescarolos, which were on the pace immediately. Quite surprising was the performance of the new Judd engined Lola, entered by the Czech Charouz Racing System team. In LMP2, there were quite a few more familiar machines, with the exception of the very quick Zytek 07S. The most important addition to the GT class was the 997 version of Porsche’s highly successful GT3 RSR. It proved quite a bit more competitive than its predecessor. Peugeot’s presence is also visible in the support program, which sees the Classic Endurance Racing (CER) grid complemented by the Peugeot 207 Spider Cup. The one make racing series features mid-engined open sportscars that look somewhat similar to the open-top prototype racers. With a field of nearly twenty cars, it was quite a turn-out for the first ever race for the compact racer. Both the CER and 207 Spider Cup are set fixtures for the five European rounds of the Series, and at each race there are one or two additional support races. This role was taken at Monza by the World Series by Renault and the local Superstars cup. The Renault single seater championship is one of the feeder series for the likes of Formula 1. The Superstars cup is open to large, V8-engined saloons like the Audi RS4, BMW M5 and Jaguar S-Type R. Among the drivers was former Formula 1 racer Gianni Morbidelli. After some disappointing turn-outs last season, the first round of the CER was very well attended. Stretching the age limit to 1979 has contributed to that as well as the promise of a place on the 2008 Le Mans Classic grid for the champions. Another great thing about the start of a fresh season is the many new liveries and this year the teams really outdid themselves. A first sign of the good things to come was the Gulf livered Barazi Epsilon Zytek and the retro trend has continued. Henri Pescarolo celebrated his new role as manufacturer with a paint scheme very similar to the Matras he drove to three Le Mans wins back in the 1970s. The Czech Lola also transformed from an all carbon fibre look at Paul Ricard to a colourful mix or white, red and blue. Peugeot’s half-painted look remained unchanged and still does not look quite right. The first of three practice sessions helped shed some light on things and it quickly became obvious that the Peugeots were quick, but by no means dominant. Ricard’s surprise performance of the Judd engined Lola was proved to be no exception as it was in the top three throughout the first three hours of the weekend. In LMP2 the dominance of the Iberian / Quiffel Lola continued, with the new Zytek and the Bruichladdich Radical. As always outright speed did not seem a priority for the two-time Le Mans winning RML team; in the end it’s the race pace that counts. Both GT classes followed a familiar pattern with the action in GT1 too close to call and with GT2 a two make battle between Porsche and Ferrari. The most noteworthy incident in the free practice sessions was a big fire during the refueling of one of the Alphand Corvettes. Two crew members suffered burn injuries and to get their heads together, the team skipped the third session. After three hours of practice, the starting positions were decided in two 20 minute sessions; the first for prototypes and the second for the GTs. Stephan Mucke in the Charouz Lola was the first to top the lists, but it didn’t take long before the two Peugeots showed their true colours, clocking the two fastest times, over 1.5 seconds ahead of Mucke. ‘Quick’ Nic Minassian did his nick-name justice by capturing the pole. There was another second separating the new Lola with the fastest Pescarolo, the two Courages and the Racing for Holland Dome. Less than five seconds behind the fastest Peugeot, the Team Quiffel Lola topped the LMP2 chart ahead of the Zytek and the RML MG-Lola. Separated by less than four tenths, the top three in GT1 consisted of three different machines with the Team Oreca Saleen just ahead of the C6.R Corvette of Alpand and the Team Modena Aston Martin. In GT2 there was quite an upset with two Porsches taking the better of a group of Ferraris. Best of the rest was the Team LNT Panoz in seventh. After a trouble-free warm-up on Sunday morning, it seemed all 47 entrants looked ready to start the race, but tragedy struck for the Barazi Epsilon Zytek. After the out-lap a fuel leak was discovered and the car was pulled off the grid and was not ready in time to start the race. This was by no means the end of the drama for the LMP2 class, which saw all but one team come in for lengthy repairs or early retirements. The remaining 46 cars got on with things without a hiccup despite the reputation of the Monza’s first chicane. There was talk in the paddock that one of the Peugeots would take off as a hare, which was quickly proven wrong as both 908s stuck together and gradually moved away from the chasing Charouz Lola and ‘yellow’ Pescarolo. Both Radicals were out within a few laps, leaving the dice for the LMP2 lead very much a RML versus Team Quiffel affair. Close competition has been the hallmark of the Series’ GT1 class and in the opening stages there was a close fight between the Alphand Corvette C6.R and the Oreca Saleen as well as for third between the fastest of the Larbre Astons and the similar car of Team Modena. The fight for the lead came to a premature end when the Oreca Saleen dropped out of the race; so much for the assumed reliability after the successful 24 hour test at Paul Ricard. Porsches and Ferraris dominated the leaderboard in GT2, with the Spykers, Panoz Esperantes and the Corvette unable to keep up. Little over thirty minutes into the race, suspension on the slower of the Larbre Astons failed in the fast Ascari corner and the car spun violently. Surprisingly the Armco barriers were not touched, but the car blocked the track to the extent that a full course yellow is required to move the car. Some cars used the opportunity to pit and others didn’t. Shortly after the safety car pulled off, Jean Marc Gounon in one of the Works Courages tried to outbrake the Charouz Lola from a silly distance and tapped it round. This was the beginning of a very difficult period for the new Lola with a lengthy pit stop for repairs, leaving it out of contention for the top places. After the second round of pit stops both Peugeots suffered from an open passenger side door and both had to come for a brief stop to rectify the problem. It’s amazing that such a vital part of the car was not designed to function under the harshest conditions from the beginning. There was more trouble ahead for the second placed Peugeot, which limped back to the pit. The mechanics took five laps to patch the V12 engined machine back up and it then set about on a remarkably fast run to the finish. Lapping at speeds of over two seconds faster than the closest competition, the places lost were made up with Audi-like ease. A bit down the order, both the RML and Quiffel Lolas fell victim to the LMP2 bug, although the MG Lola of RML was able to continue. This left a very unlikely victory to the Horag Lola, which quietly went about their business and stayed out of trouble. RML was second and Binnie Motorsport finished third, as they have on so many occasions in recent events. The weekend started so very poorly for Luc Alphand and his team, but the first and third in class was a very big consolation price. Larbre took second in class. GT2 turned out to be an all-Ferrari affair as one by one, the challenging Porsches dropped out of the race. At the head of the field, the Gene/Minassian Peugeot consolidated their one-lap lead over the second placed Pescarolo and completed the 1000 km race in little over five hours. The second 908 had fought all the way back to third and regained three laps on the leader. The one-three finish was probably better than even Peugeot had expected and if the small bugs can be ironed out, they could challenge for a win at Le Mans a year earlier than first thought possible. As at Le Mans last year, a flawless performance of the small Pescarolo team was just not enough to beat a diesel engined, works team. Whether it was the Peugeot presence, the lovely weather, or better promotion, the crowd at Monza seemed larger than at recent Le Mans Series races; at several corners the grandstands were almost filled to capacity. Of course the big winner of the weekend is the Peugeot team, although we were also happy to see Luc Alphand finally take a class win. The big loser might well have been Audi, who were quite convincingly beaten at Long Beach in the ALMS and seemed to have gained a very big competitor for the upcoming 24 Hours of Le Mans race. This development can only be good for the sport and the spectators.